Optimum Ball Position: Does an Inch or Two Make a Difference? yet an inch or two divides opinion. Where you position the ball in your stance is a personal choice. However, you should always use a consistent position. This can range from the middle of your stance to the inside of your left foot. If you spread your feet and remain in balance, the middle of your chest (your sternum) will be centred in your stance. In a symmetrical putting setup your putter will be soled so that it rests on the ground directly beneath your chest. In this position your putter shaft should be vertical. Your hands can be a fraction forward if you putt with an off-set putter. No problems here - but where should your ball be? It is here that opinion can differ. One view states that with your putter in the middle of your stance, your ball should be positioned just in front of your putter. Another view states that your ball should be advanced in your stance an inch or two forward of your centre line. There are no outright winners in either opinion as putting setups and styles vary from person to person. Some golfers have their hands well forward at address while others forward press at the start of their stroke. Another variable in setup is the weight distribution between the left and right foot. Some golfers place more weight on their left side by leaning in towards the hole. Added to this there are the different putter paths from straight back and through to inside-square-inside. If you favour the latter, your ball position becomes more critical as there will be only one position where your putterface will be perpendicular to your aimline (target line). The only common ground among experts is that whatever your ball position, it should remain fairly consistent. Moving it back and forwards randomly in your stance can lead to missed putts. If your ball is too far back, you will push it. If it is too far forward you will pull it off line. So where do you stand with these different views? Faced with the question of what is the optimum ball position in relation to the vertical arc of the putter, it boils down to two answers. 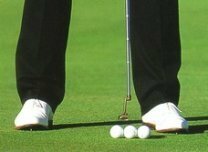 The first is that your putter should strike the ball exactly at the bottom of the arc of your putting stroke in the middle of your stance. The second is that you should catch the ball slightly on the upstroke by placing it forward in your stance. There are few advocates for hitting the ball on the downstroke. In a no-frills and symmetrical putting setup your putter is soled in the middle of your stance. Your weight is evenly distributed and your hands are level with your ball. In turn, your ball is positioned just forward of centre with a small gap of grass between it and the leading edge of your putter. I believe a simple setup such as this is best unless you are able to spend time perfecting and practising your own individual technique.